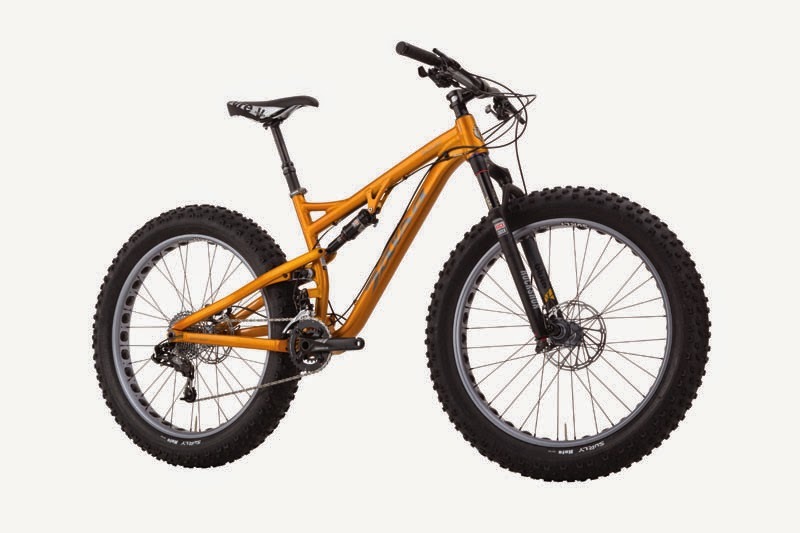 The Salsa Bucksaw is the first production full-suspension snow bike. In addition to being highly anticipated by avid fat bike riders, it's been well-received by the cycling press as well. It's the next step in the evolution of snow bikes, and if you believe some people, the next step in the evolution of mountain bikes overall. "Salsa designed the Bucksaw’s suspension from a blank slate, rather than adapting an existing skinny design, and they nailed it." "... the Bucksaw positively rails singletrack, skips over rugged sections, and floats atop chatter bumps like a hovercraft, or, perhaps, a town car." You can read their full review here. "Fat bikes aren’t just for snow anymore; the big tires are big fun all year round and the Bucksaw is breaking trail in a whole new market." " Is it faster? Maybe? Is it better? That’s a loaded question. Is it fun? Oh hell yeah." We have a Salsa Bucksaw 2 in stock in Medium size in our Winter Cycling Wonderland at the Century Cycles store in Peninsula. A Large is on the way; when these two are gone; that is all for this season!